This baked chicken is not only easy to prepare and cook; it's also easy on the budget. 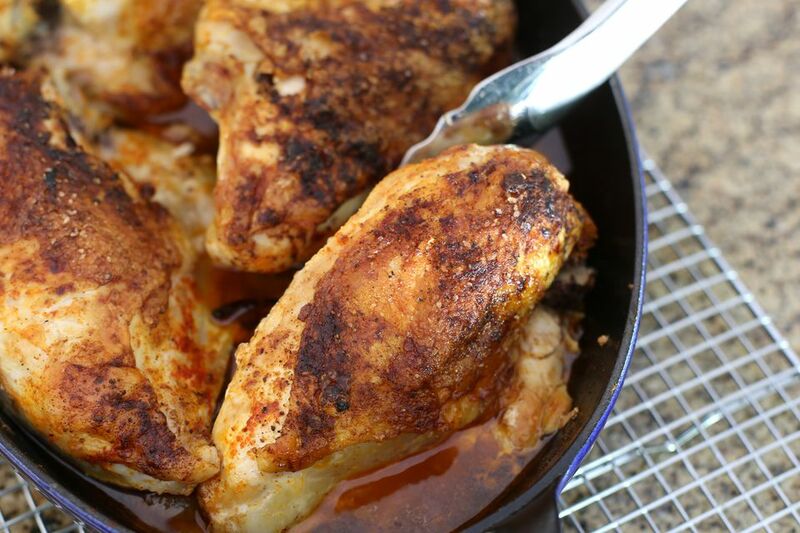 I like chicken thighs or whole legs in the dish, but it is excellent with split chicken breasts as well. The simple seasonings don't hide the great flavor of the chicken, and the sweet onions are complementary. This easy baked chicken is dredged in flour seasoned with a little salt, pepper, garlic powder, and paprika. The chicken is browned then baked with sweet onions to crispy perfection. Use sweet Vidalia onions if they're in season. It's a very easy dish to fix with chicken parts. Use two quartered chickens or about 4 to 5 pounds of thighs, legs, or bone-in chicken breasts. Heat the oven to 350 F. Grease a large, shallow baking pan or roasting pan. In a bowl, food storage bag, or pie plate, combine the flour, salt, pepper, paprika, and garlic powder. Toss chicken pieces with the seasoned flour until thoroughly coated. Place a large, heavy skillet over medium-high heat; add the olive oil. Working in batches, add chicken pieces to the hot oil. Cook for about 5 minutes total, turning to brown the chicken pieces on all sides. Arrange the browned chicken pieces in the prepared baking pan. Add the onions to the skillet and cook for 2 to 3 minutes, just until softened and coated with oil. Arrange the sweet onion slices around the chicken. *Chicken must be cooked to at least 165 F (73.9 C). Check the temperature with an instant-read thermometer inserted into the thickest part of the meat, not touching bone or gristle. Oven Braised Chicken With Sweet Onions: Toss the chicken with the seasoned flour and place in the baking pan. Scatter the onions over the chicken and add 2 to 3 cups of unsalted or low sodium chicken broth to the pan. Drizzle with 4 to 6 tablespoons of melted butter or olive oil. Bake in the preheated oven for 25 minutes to 1 hour, or until the chicken is tender and tests fully cooked. Add sprigs of fresh herbs to the chicken in the baking pan. Scatter a few sprigs of rosemary or thyme around the chicken and onions. Add some carrot sticks or baby carrots to the skillet along with the sliced sweet onions. Roast the carrots and onions together along with the chicken pieces.